26 March 2014. Engineers at Iowa State University in Ames created a device about the size of a microscope slide that can quickly test the effects of genetic changes on plant characteristics, rather than growing sample seeds in soil. The team led by electrical and computer engineering professor Liang Dong, with colleagues from Iowa State and Georgia Institute of Technology in Atlanta, appears in the 7 April issue of the journal Lab on a Chip (paid subscription required). Testing plants with genetically engineered traits, such as drought resistance, and under various environmental conditions, normally requires growing seeds in greenhouses or testing fields, processes taking enormous amounts of time and labor. Dong and colleagues aimed to develop a lab-based system that can provide plant geneticists with the same answers, but much faster and with greater control. Their solution is, in effect, a greenhouse on a chip, funded by a three-year grant of nearly $700,000 from National Science Foundation. 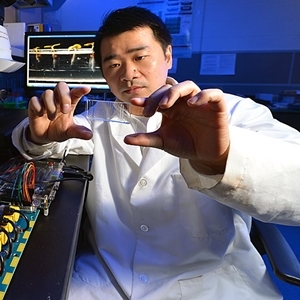 The researchers devised a microfluidic chip, a hand-held clear plastic strip with thin channels housed in the plastic. The channels make it possible for a seed to germinate in in the chip, and for lab staff to monitor plant growth into a seedling from cells to the whole organism, including roots and shoots, without damaging the seed. Dong and colleagues tested the chip on mutations of Arabidopsis, a small flowering plant related to cabbage and mustard with well-documented genetics and associated plant characteristics, often used as a model in the lab. The chip made it possible for the team to track growth of a mutation of Arabidopsis, as well as changes occuring when the plant encountered a pathogen at different stages of its growth. The two-week time needed for the growth to occur on the chip, report the researchers, was comparable to using conventional lab cultures. Dong envisions hundreds of greenhouse lab chips growing thousands of plants simultaneously, with each chip representing a different environmental condition: e.g., humidity, temperature, carbon dioxide, or pathogens. Robotic arms would record data and images of the plants’ various characteristics, such as root development and shoot size. The images and data collected would then be stored in databases and made available for analysis by advanced informatics tools. Agronomist colleagues at Iowa State, reports the university, are not waiting for development of that ultimate system. They are already using parts of Dong’s technology to study germination of pollen at various temperatures and the interaction of fungus pathogens with soybeans at different moisture levels.